⑴ Japanese culture definitely influences American fashion. ⑵ One of my favorite Japanese Proverbs is: fall down 7 times stand up 8! ⑶ When you look at Japanese traditional architecture, you have to look at Japanese culture and its relationship with nature. You can actually live in a harmonious,close contact with nature. This very unique to Japan. ⑷ Japan, not on the mega busy city that thrives on electronics and efficiency, actually has an almost sacred appreciation of nature. 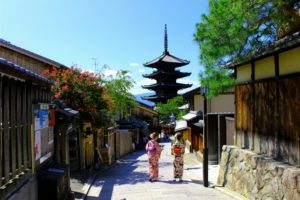 One must travel outside of Tokyo to truly experience the old Japan and more importantly feel these aspects of Japanese culture. ⑸ Culture and tradition have to change little by little. So “New “mean a little twist, a marriage of Japanese technique with French ingredients, my technique, Indian food ,Korean food, I put Italian mozzarella cheese with sashimi. I don’t think new new new. I am not a genius. a little twist.